The cookies have been baked, the presents are wrapped, and I'm anticipating one of the happiest Christmases we've had in years. We have a six-year-old who still believes in Santa Claus, a toddler who is in a constant state of wonder at all that's going on, and a baby who loves nothing more than to be snuggled. It's so much fun having grandchildren. Blessings abound! 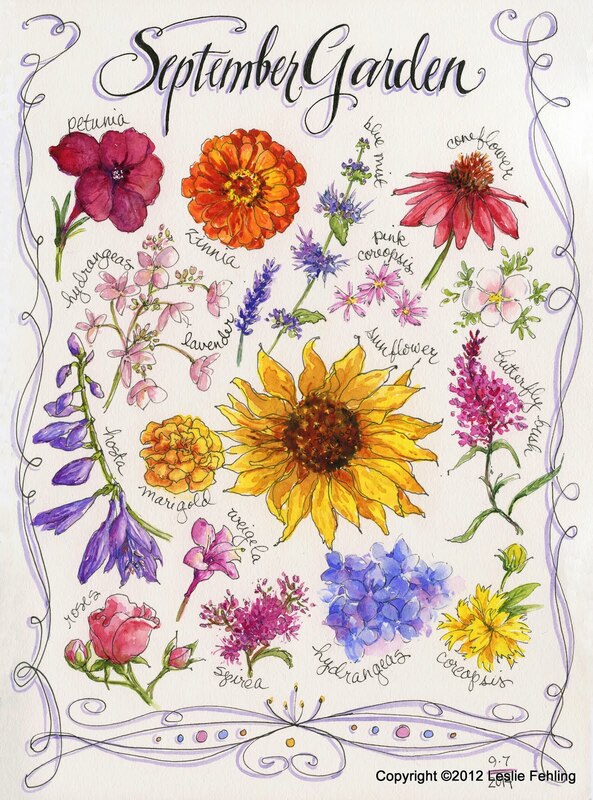 Thank you for being a part of my journey through 2012 here on the Everyday Artist blog. I've appreciated all of your encouraging comments, and value the friendships that have grown through our communications with each other. I'm excited to see what 2013 has in store for us! It was just a day like any other, I guess, but I got a real kick out of the whole 12-12-12 thing. I just think it's really cool! Like glancing at the clock and seeing that it's 11:11 or 10:01, or looking at my odometer and seeing 12,345. It's fun! Significant numbers give me a little burst of happiness. So, I wanted to remember this very memorable day in my sketchbook. 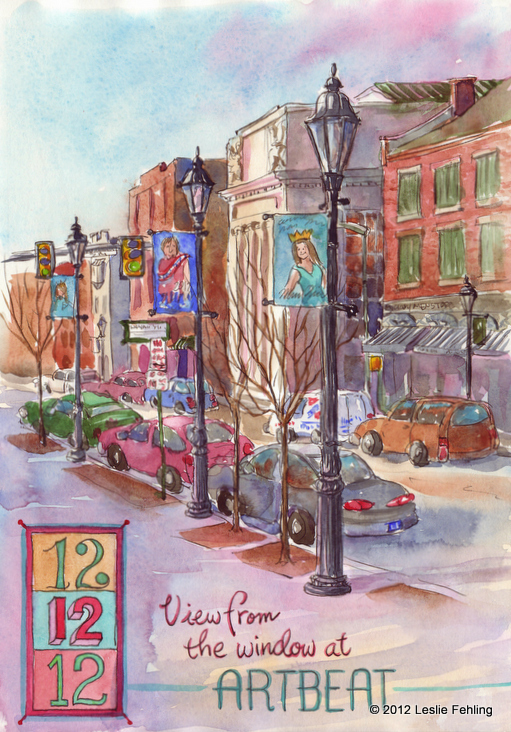 Since I was working at Artbeat gallery this afternoon, I sketched the view from the side window, looking out at High Street, the main drag through Waynesburg, PA. I liked the banners hanging from the lamp posts, especially the one with the beauty queen on it. (One of our local girls won the Miss Ohio pageant this year.) The other banner salutes a native Greene Countian who won a bronze medal for wrestling at the 2012 Olympics. The drawing's a bit wobbly since I had to stand at the window to draw, but I like the resulting casual look. In between talking to visitors and waiting on customers, I added the watercolor. As the afternoon shadows lengthened, the foreground was bathed in shadows, while the old bank building across the street, with its stately columns, caught the last of the sunshine on this cold December 12, 2012. Did you do anything special to commemorate 12-12-12? For the past several weeks, I've been working on a pretty bedroom ensemble for one of my favorite customers. A lush cream-colored cotton sateen with a silky sheen was her fabric of choice for the bedspread and pillows, with accents of antique gold sateen. The gold fabric echoes the color of hundreds of brass nail heads which march along the wall just above the chair rail and below the crown molding. The deep purple walls gleam with flecks of gold. To add interest to the wide expanse of the bedspread, I stitched criss-crossing rows of 1/2" tucks. In keeping with the overall simplicity of the bedding design, only three pillows were used, two king-size shams and one bolster. The shams feature oversized hand-appliqued monograms and rows of vertical tucks. It took a little extra time to do the monograms, but I enjoyed relaxing with some hand-sewing for a few hours, and I love how the monograms turned out. The bolster pillow has a center section that I quilted by machine. The diamond pattern adds much-needed texture to the bedding but is understated, giving it a look that is elegant but not over the top. Shirred side sections and multiple cream-colored trims complete the design. I like adding unexpected touches to the embellished items I make, like the radiating lines on the ends of the bolster, below. I could have left the fabric unquilted, but isn't this so much nicer? The wooden bench that sits at the end of the bed got a makeover, too. Bold stripes on the slipcover and pillow add a splash of the purple wall color to the center of the room. The slipcover is fully lined and attaches to the bench with hidden Velcro closures. The bench's bolster pillow has an elaborate quilted center section that really makes it something special. A cable design takes center stage. It's surrounded by tight stippling (vermicelli-type quilting) which compresses the batting and gives the cable more dimension. A scalloped border and more stippling, in a larger scale, complete the design. Yesterday, after I installed the dust ruffle, smoothed every wrinkle out of the bedspread, plumped the pillows, and made sure everything looked perfect, I called my customer into the room. When she saw her beautiful new bedroom, the look on her face was priceless. Surprise and happiness came first, then amazement, as she studied all the little details. Her excitement and appreciation made all those hours of careful work worthwhile - I love making people happy! 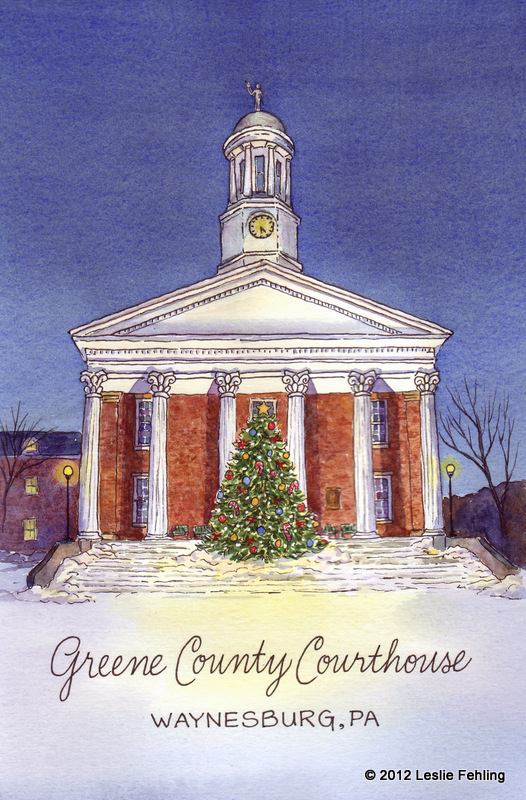 Sneak Preview... Greene County Christmas Cards! The Christmas tree in front of the courthouse has been decorated, and every lamp post in town is dressed in evergreens and red ribbons. It's time for the Waynesburg Downtown Holiday Open House! This Friday night, our town will be bustling with street musicians, horse-drawn carriage rides, and choirs of carolers, not to mention shoppers taking advantage of special sales in our great local shops. Even Santa will be stopping by! Every year, a huge evergreen is erected at the top of the courthouse steps, signaling the start of the holiday season. 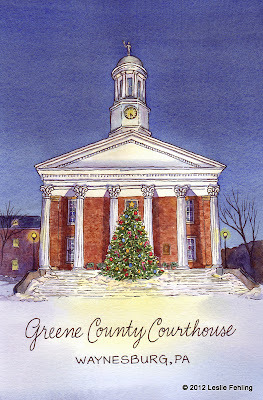 The beautiful old county courthouse is a landmark and a gathering place - a centerpiece of our community. It was our first choice when we began discussing subject matter for the cards. Our area has an abundance of covered bridges, and one of the prettiest is this one in the village of Carmichaels. It was a natural choice to include in the collection. For the third card, we decided to feature a small town. This painting of Jefferson was inspired by a small sketch I did of this scene a few years ago. 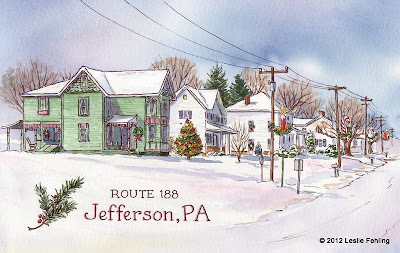 But we wanted to make it more Christmas-y, so I redrew the sketch in a larger size and added a decorated tree, wreaths on the houses, and decorations on the telephone poles. Since most of our county is rural, I felt that we needed a card to honor that fact. Since the tourism board members liked my Snowy Days sketch from 2011, we decided to digitally modify it for the cards. 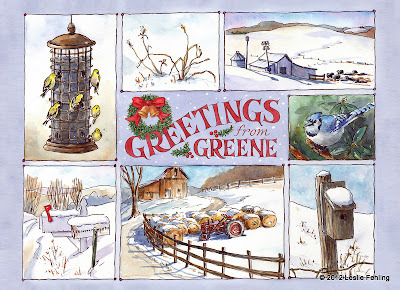 I painted the wreath and hand-lettered the "Greetings from Greene" section, then Photoshopped it in. It worked like a charm! If you're local, I hope to see you at the holiday open house. I'll be at Artbeat gallery, serving up hot cider and my famous Chewy Ginger Cookies. (I'll post the recipe soon - they're yummy!) 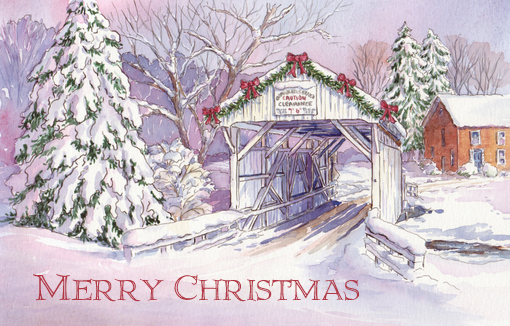 Artbeat has lots of wonderful one-of-a-kind gift ideas, plus a large selection of prints of my sketches, including the Christmas scenes featured on the cards. 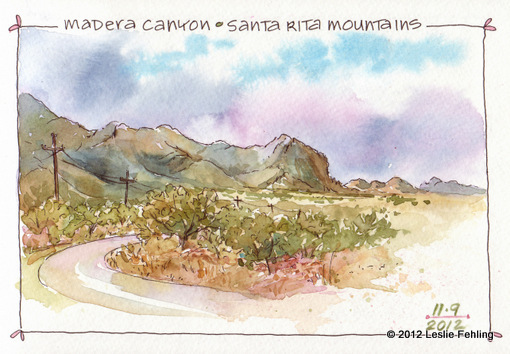 As my friend and I drove toward the Santa Rita Mountains on the final day of my mini-vacation, we were looking forward to starting our first sketch of the day. We found a pretty spot on the road to Madera Canyon and began to set up our gear, but high winds forced us to retreat to the car, which ended up being our mobile studio for the day. Our next stop was an interesting shop in Tumacacori that sells herbs and spices. 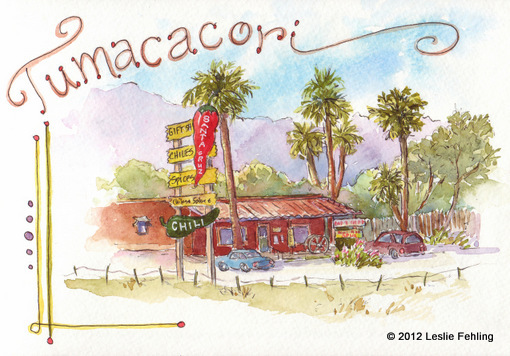 The palm trees and colorful chile sign just begged to be painted. 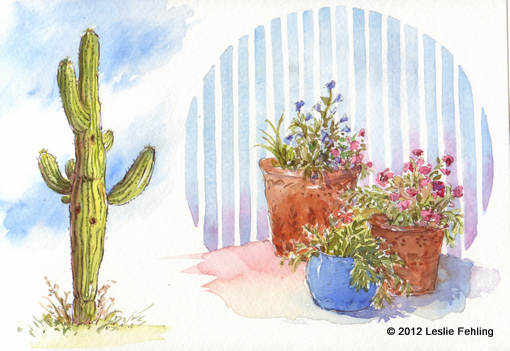 My final page is filled with growing things: a saguaro that I sketched in the neighborhood where I stayed, and a group of potted plants we spied outside a shop in Tubac. All of the sketches were done on the right-hand pages in my sketchbook, and I wrote about each day's activities on the facing page. 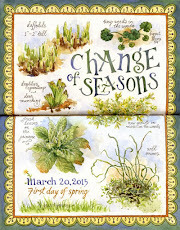 Each text page was given a simple painted border in colors that coordinated with the adjacent sketch. It helped to tie it all together and give my travel journal a cohesive look. I hope to have a chance to go back to the Tucson area again some day. There's so much more I'd like to paint! The wide expanses of desert prairie and the rugged mountains are such a contrast to the gently rolling hills where I live. The three days I spent sketching with my friend Suzie were a peaceful interlude during a time of year that sometimes seems frantic. What a gift! 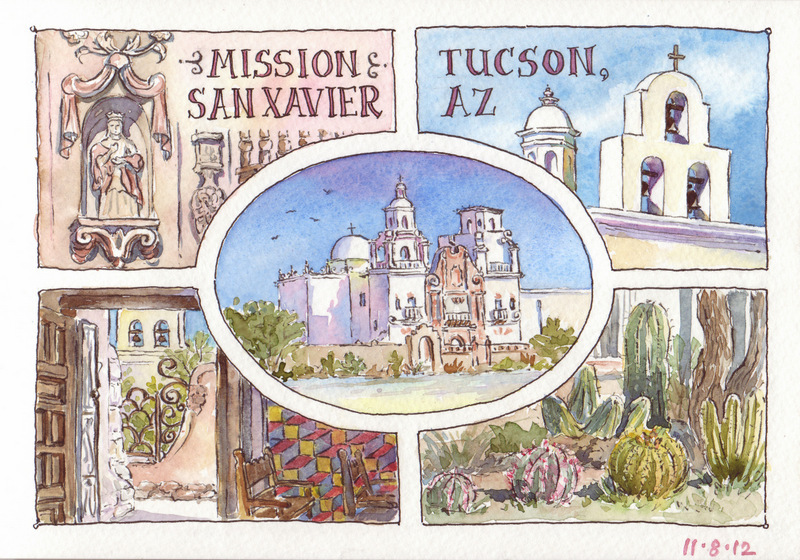 On the second day of my short visit to Arizona, we spent most of our time at the beautiful Mission San Xavier where I did this composite page in my sketchbook. I enjoy designing gridded pages, because you can include so many facets of a subject in one page. I usually do them in a large 9" x 12" sketchbook, but for this trip, I took a Strathmore 6" x 9" watercolor sketchbook, and its smaller size made doing a gridded page pretty challenging, especially when attempting to include some of the details on the mission's facade. For my first sketch of the day, I tackled the full front view of the mission and experimented with making colorful shadows. I like how they turned out. It's so much more interesting than the blue-grey I normally tend to rely on. 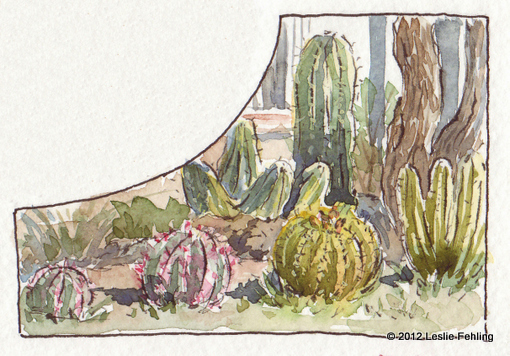 Facade detail, 4" x 2-3/4"
As the morning sun rose higher in the sky, the temperature soared, and we began to feel a little scorched, so we found a shady spot for sketch #2 near the cactus garden. Garden detail, 3-1/2" x 2-1/2"
The cement walls of the mission enclosure stayed remarkably cool in spite of the 90 degree temperatures. It gave me a comfy place to sit and kept people from constantly peering over my shoulder. 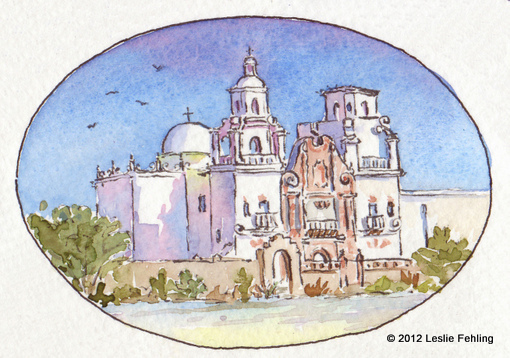 That's me working on sketch #3 at Mission San Xavier. 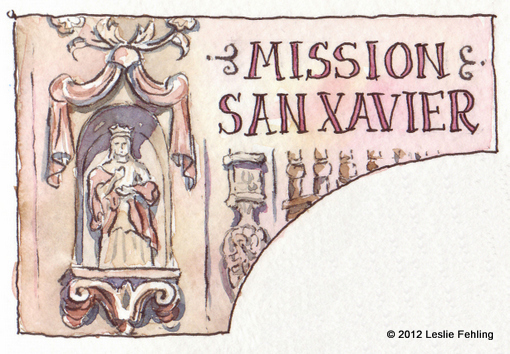 Sketch #3 is a rendering of one of the saint statues on the facade. It was fun working in a color scheme that was close to monochromatic, something a little different for me. The interior walls of the sanctuary were covered with incredibly ornate decorative painting. 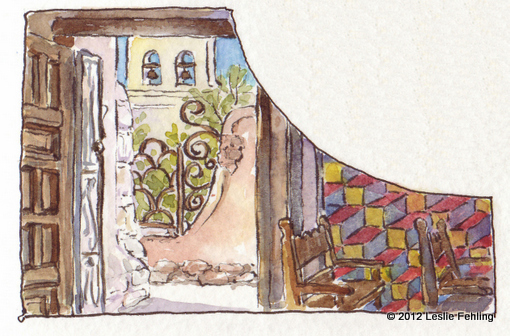 I would never attempt to duplicate it in my sketchbook, so I settled on something simpler, the view looking out from the dark, cool interior of the church to the courtyard with its wrought iron gate, and the mission bells beyond. Interior and gate detail, 3-3/4" x 2-1/2"
Detail of mission bells, 3-1/2" x 2-1/2"
At the end of the day I only had one page to show for several hours of work, but it was fun experimenting with a different layout format and capturing a variety of views of that gorgeous old mission church. And just having the luxury of hours to spend painting was reward enough for me. Just look at the blue of that sky! 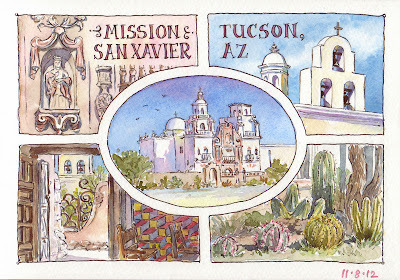 You all know I love to travel, and when my friend, Suzie, invited me to join her in Arizona for a few days of sketching, I just couldn't pass up the opportunity. 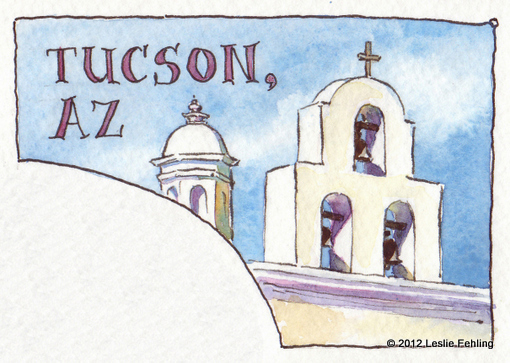 I've been to the southwest before but not since I took up sketching and never to the Tucson area. I was really looking forward to painting scenes that were entirely different from what I see at home in Pennsylvania. The first day, we visited the historic town of Tubac, just south of Tucson. One of the earliest settlements in Arizona, it's a quaint little town filled with galleries and shops, along with an old fort and museum. We settled ourselves on our folding stools on one of the side streets to sketch this tiny house, with its porch posts made from curvy mesquite branches. It felt so good to be sitting in the warm sunshine without a care in the world, and nothing to think about except "Hmmm, now which blue should I use to paint the sky?" Engrossed as I was in my painting, I barely noticed when my friend suddenly blurted out, "Horses!" I looked up and saw a man walking two miniature horses up the road in front of us, pausing to let them sniff and munch along the way, just as if he were walking a dog. 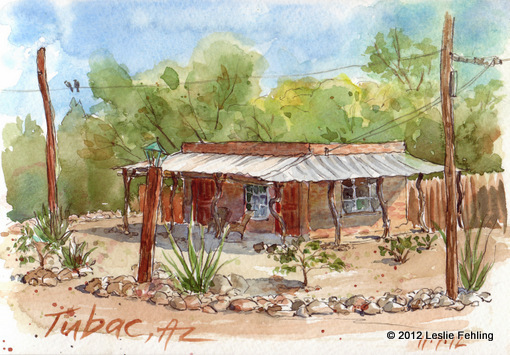 Miniature horses and the house I sketched in Tubac. When they came back by us on their way home, we had a chance to pet them and talk to their caretaker. He said they're therapy horses, and he takes them to visit children in a local hospital. They were sweet, friendly and well-behaved - and just as cute as can be. You just never know what you might see when you go out sketching! 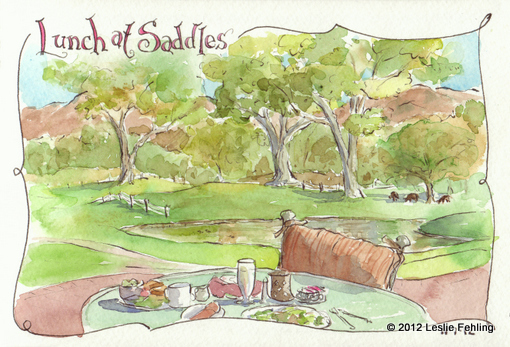 Later, we had a leisurely lunch outdoors, overlooking a golf course, pond, grazing cattle, and the Santa Rita mountains.We pulled out our sketch kits and kept busy while we waited for lunch to arrive. 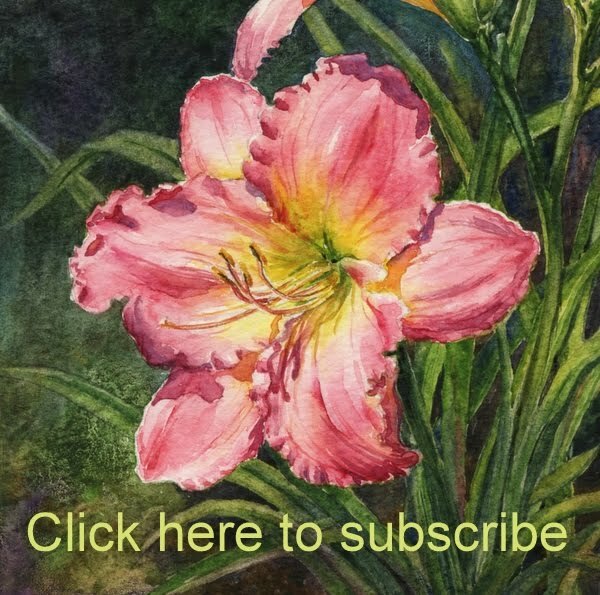 I continued to add watercolor to my page between bites of Cobb salad, and while savoring spoonfuls of creamy flan flavored with a hint of lavender. Obsessive? Well, maybe just a smidgen... but we were having so much fun! A bit of drama was introduced into the bucolic scene I was sketching when a lone steer (or bull?) somehow wandered onto the golf course, right smack in the middle of the fairway. He hung around for awhile, watching the golf carts go by, seeming unimpressed by all the goings on. Then the herd of cows (on the far right in my sketch) wandered over to see what was happening. They never did make it over to the patio where we were sitting. Good thing, because my salad was delicious and I really didn't want to share! We ended my first day in Arizona with a yummy Mexican dinner and a spectacular sunset. 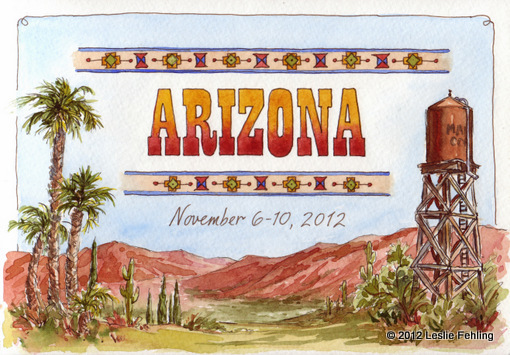 Be sure to check out my friend Suzie's blog, Creating in Alaska, and stop back here tomorrow for more sketches from Tucson. Step-by-Step Watercolor Painting: "Autumn Glow"
Walking along the edge of the woods, kicking at the piles of crunchy leaves, I moseyed along searching for just the right spot to park myself and sketch. 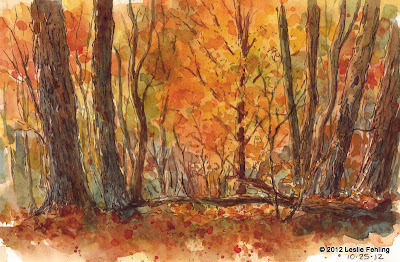 When I glanced downhill and saw the scene below, a brilliantly colored beech tree framed by oaks and maples, I pulled out my sketchbook and started drawing. Just for kicks, I took photos as I worked, to show you the progression of this little sketch. With a Noodler's flex pen and Lexington grey ink, I quickly drew the scene in my everyday sketchbook, an Aquabee Super Deluxe 9" x 12". Then I splashed on a rich layer of cadmium yellow to give the woods their glow. Feeling almost giddy with happiness to be painting outdoors on a perfect fall day, I flooded a flamboyant orange into the yellow and flung spatters of the same across the page. Whether the picture turned out well or not, I was having fun! Then I got so engrossed in my painting that I totally forgot to take photos! That whole right-side-of-the-brain thing really took over as I added the muted background colors, the foreground trees, and more glazes to the beech tree foliage. 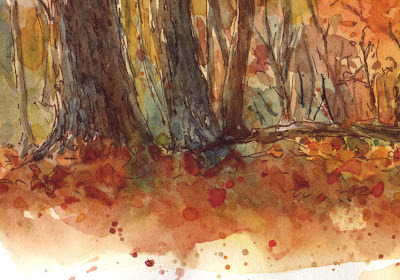 When I "woke up" from my watercolor dream, it was time to head home. I'd made a good start - the finishing touches could be added later in my studio. I realized later that my tree shape had gotten all out of whack when I was painting in the woods, so I tried to tone down the upper left of my huge orange blob of a tree to make the shape more pyramidal. I added a bit more variation in the leaf tones, too, and darkened the shady side of the trunk. The blue I used in this sketch was Pthalo, instead of my standard ultramarine blue. I worked on the tree trunks a bit more and added a few dark touches in the background. The fallen log was finally painted, along with the small sapling in the foreground. The carpet of dried leaves were indicated with a brush and a sponge. Spattering suggested more forest debris and leaves. There are things I would do differently if I painted it again, but I like it. Can't you tell how happy I was sitting out there under the trees, just me and the chipmunks, and the big, blue sky, and the whole forest aglow around me? I spent a relaxing Saturday afternoon filling in at Artbeat last weekend and had a free hour at the end of the day to do a little sketching. This is the sitting area in the back room where visitors are invited to kick back with a cup of tea and linger awhile. 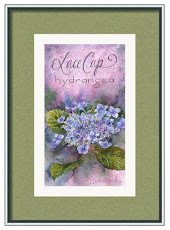 Owner Linda Winegar has done a fantastic job of getting the gallery up and running, and it's fully stocked with a wide selection of handmade art and fine crafts. 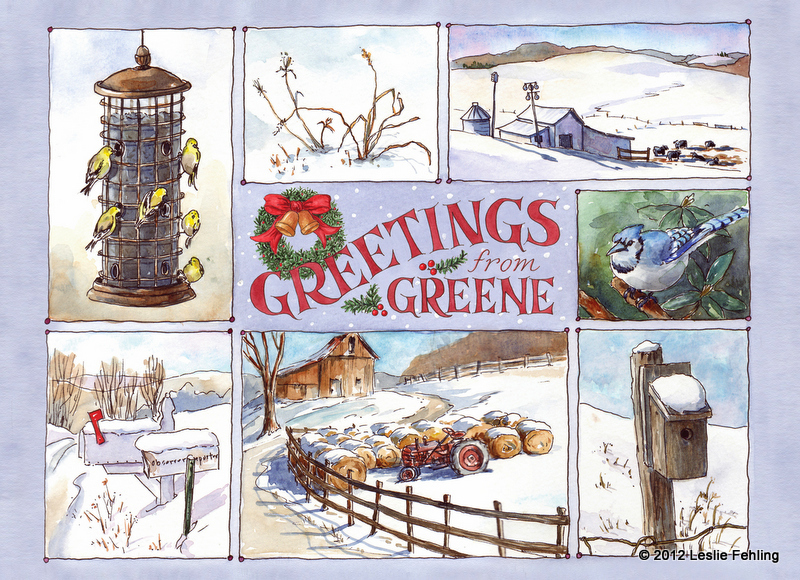 If you live in or near Greene County, PA, I hope you'll have a chance to stop by and do a little Christmas shopping. And check out the latest prints of my sketches! Sometimes the biggest challenge with art is just finding the time to do it. 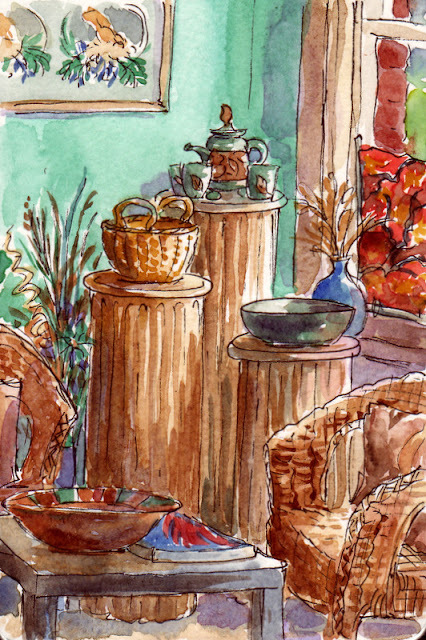 Sketching solves that problem - it only takes a few minutes to record a slice of life. My days have been really busy lately, with lots of pre-holiday orders in my sewing business and two sweet babies to help care for, which means precious little time for art. 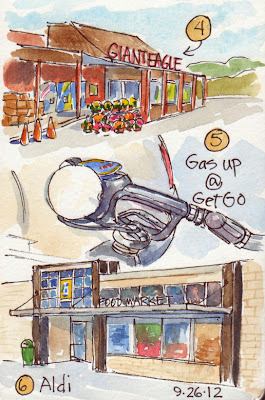 So, the other day, when I dashed into town to run some errands, I decided to do a super-quick sketch at each of my stops. 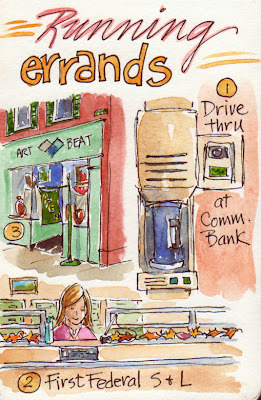 I felt very self-conscious sketching the drive-thru at the bank, knowing the security camera was recording my every move. Would they think I was planning a heist? And for my next stop, at another bank, I knew I had to work really quickly as I stood at the table where they keep the blank deposit slips and that little pen on a chain. I didn't want anyone to think I was scoping out the scene for some nefarious purposes! 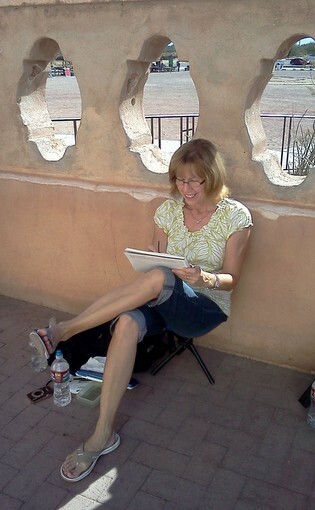 I was a lot more relaxed for the next sketch at Artbeat. Leaning against a lamp post across the street from the gallery, I was able to complete the ink drawing in just a few minutes. Then I was off to the grocery store where a display of fall mums caught my eye as I sat sketching in the van. Before heading home, I pulled into the gas station and managed to do a quick sketch during the time it took to pump 18 gallons into my tank. One more stop to pick up a few groceries at Aldi, then I was on my way down the road. Six errands completed, along with six line drawings, all in the course of two hours. 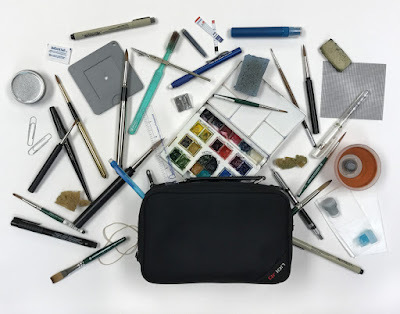 Sketching on the go - it's efficient and fun! I occasionally join my husband for a flight in the vintage Super Cub that he flies out of the grass strip here at our house. I don't go up too often, because I'm just not a big fan of small enclosed spaces (and heights), but it is fun on a summer evening, when the colors take on a beautiful glow and the shadows stretch across the fields. 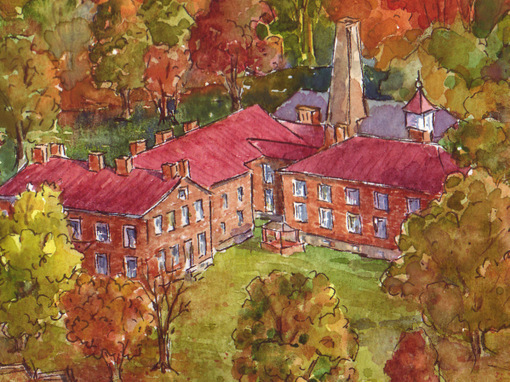 Or in the fall when the hardwood forests around here put on a show to rival New England's. On one of those autumn flights, I took my camera along and shot a few photos to paint from later on. 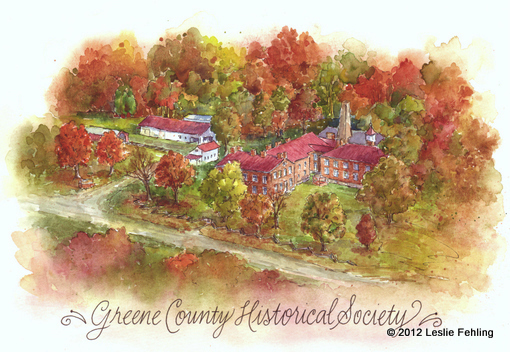 One of those photos was the basis of this painting of the Greene County Historical Society Museum in Waynesburg, Pennsylvania. 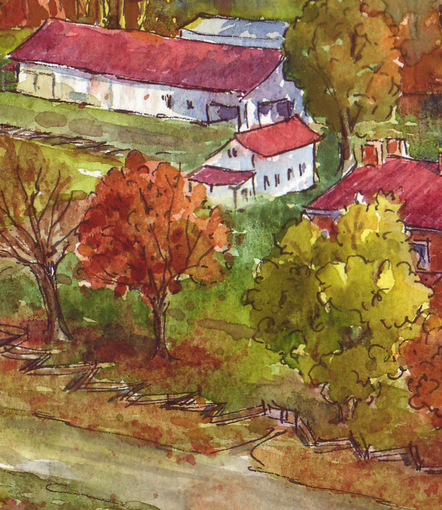 I sketched the museum and grounds last October but didn't get around to painting it until two weeks ago. It's been a gorgeous fall around here this year, and I think it got me in the mood to finish this little sketch that has languished in my sketchbook waiting to be brought to life with watercolor. Prints of this painting are available in the museum gift shop and at Artbeat gallery in Waynesburg, PA.